Common Name: Translation: "red bark." Comments: Spectacular bright salmon-red shoots in winter. 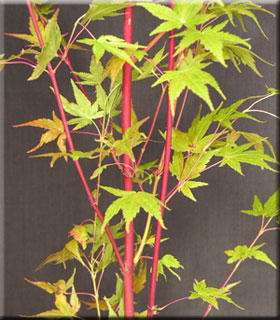 Deeper and more persistent color on older stems than on the cultivar 'Sango kaku.' Five to seven-lobed green leaves are edged with red. Turns a wonderful golden yellow in the fall.